Invermoriston is the small hamlet built around the junction between the A887 from the direction of Kyle of Lochalsh and the main A82 along the western shore of Loch Ness. 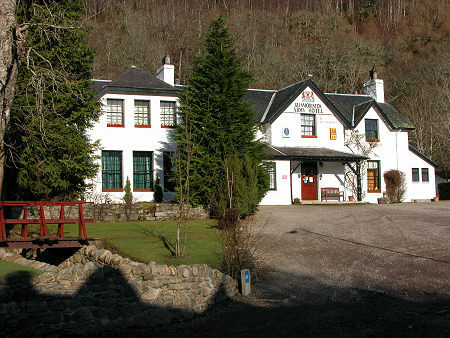 The focus of this largely white-harled settlement is the Glenmoriston Arms Hotel. This was built in the 1800s and took over the trade developed by its predecessor, the turf-built inn that served Johnson and Boswell as they passed along the lochside track in 1773. The Hotel lies at the heart of the village, overlooking the main road junction, and also offers a separate tavern and bistro. 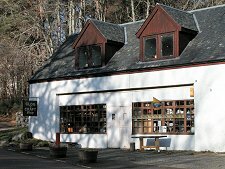 And the modern visitor will also find a post office and general shop and a craft shop. 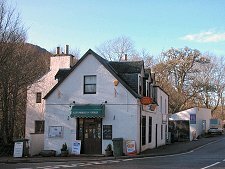 Signs in the village reveal that Invermoriston lies on the Great Glen Way, the 73 mile long distance path from Fort William to Inverness. 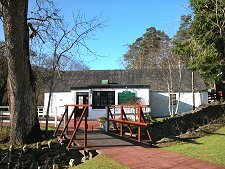 Since the launch of the walk in 2002 it has brought a steady stream of pedestrian visitors to Invermoriston with time to appreciate what it has to offer: this is a village all too easily overlooked by the occupants of the convoys of cars making their way up or down the A82. Invermoriston itself dates back to at least 1600, and in the 1640s a sawmill was in operation processing the surrounding woodland for export by boat. Although there were tracks in the 1770s, the first real roads along the west side of Loch Ness and west towards Glen Shiel were built by Thomas Telford in 1813. The military roads built along the Great Glen in the 1700s had passed to the east side of Loch Ness, leaving Invermoriston heavily dependant on water transport. 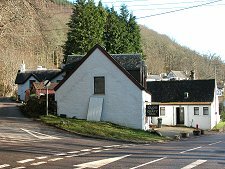 The village grew slowly through the 1800s, and by the 1890s the Loch Ness steamers called regularly at the pier half a mile to the south. Today the steamers have long since ceased to ply the loch.